How exactly do LeBron James and Steph Curry compare when it comes to social media? ESPN Sports Business Analyst, Darren Rovell, dug into how the two athletes compare from a marketing aspect on Tuesday’s edition in the Real Money on SportsCenter. Darren discussed how they both stack up on social media in regards to total following and their rate of growth while citing Hookit as his official source for the social media analytics backing his opinions. Check out the clip from the “Real Money” segment on Tuesday’s edition of SportsCenter. 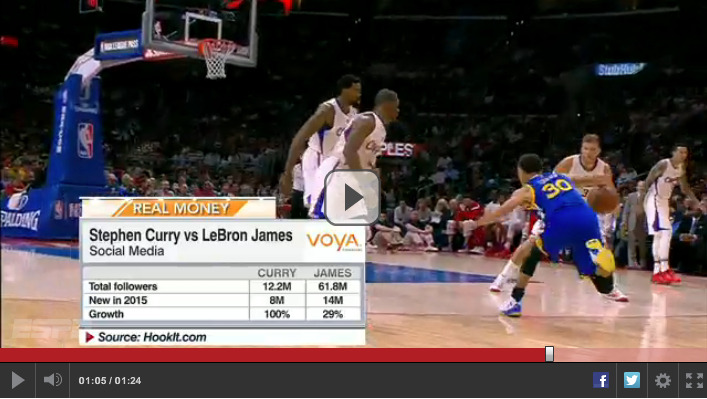 Want more detail on exactly how the social media numbers of Lebron James and Steph Curry compare? Check out the graphic below to see how the two stack up against each other in regards to total followers, follower growth, and interactions.